Sport gives children the opportunity to grow into well-rounded, confident, hard-working adults and we’re going to list 10 reasons why kids should play sports! 1. What else are they going to be doing with that time? If your child did not going to sports training, what would they be doing? In reality they would probably be watching TV, playing games on your phone or iPad or jumping off the furniture…. Wouldn’t you much rather your child be out in the fresh air at soccer practice, running around, and learning the value of teamwork! Sports remain incredibly important as they grow into teenagers as well and put their time and effort into something productive. 2. Develop social skills. Developing social skills is another huge part of parenting, and one that needs to be developed at a young age if wanting to lead into the future. One of the best ways to develop a child’s social skills is through getting involved in sport, particularly team-based activities. Communicating new ideas, listening to others as part of a group, and using communication to solve problems by working as a team, just a few of the things children learn from getting involved in sport. Children can grow into the first leadership role of their lives by taking a captains role in a sports team. Exposing children to environments where communication is key, will really pay off in the future. Their communication skills and ability to play a role in a team or as a leader will come in handy as an adult in the future. 3. Doors will open to unique opportunities. When I was staying in Hawaii, there were a few soccer teams staying at the same resort we were staying at because they had their soccer tournament on that weekend….. IN HAWAII!?! These kids were ages from 12-16 and I bet they I would not have had those opportunities otherwise! Throughout their years of playing sport your children may have the chance to meet met world-class athletes and be able to learn from them. 4. Build self-esteem and confidence. Moving back to the development of personal, social-based skills, self-esteem and confidence are two further areas where children can benefit through playing sport. 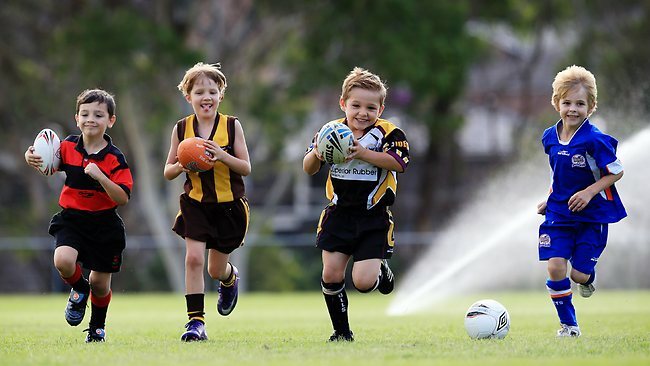 Sport is a great way to boost a child’s confidence through encouragement and compliments, highlighting areas where they are doing well and rewarding them for showing improvement in these areas. Aside from a coach and parent’s encouragement, there is no greater feeling as a child than playing a major role in some sporting success. 5. Make new friends. Getting children out into new environments is a great way to helping them make friends. Engaging your child in sport can lead to healthy social benefits, meeting new people that could develop into life-long friends. Nobody likes to see their children locked away in their room when they could be out socialising with friends, and sometimes all they may need is a nudge and some encouragement to come out of their shell. Sport for youngsters is as enjoyable in its social aspects as it is for its physical ones – and you can only do that by going out and joining a sports club. Plan your fitness with the 'Results PT' iPhone app – Book your classes, view our schedules and organise your training week. Download the app from the iTunes store here. RIM Takes On Rise Nation! Can You Exercise Whilst Pregnant?